The Bureau of Labor Statistics (BLS) reported a large increase in jobs in February as compared to January. At the same time the January jobs data was revised lower, which gave a boost to the February number. Let’s look at what happened to the people behind the numbers. 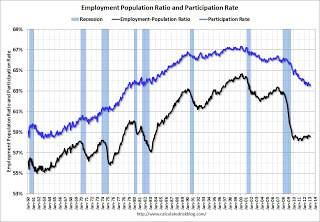 This graph shows two sets of data: the Employment to Population ratio and the Labor Force Participation rate. These are updated with February data. They show that the percent of the population employed has not changed in February. The Employment-Population ratio was unchanged at 58.6% in February (black line). It also shows that fewer members of the labor force are working.The Labor Force Participation Rate decreased to 63.5% in February (blue line). This is the percentage of the working age population in the labor force. How can this be true with all the jobs added and the drop in the unemployment rate that the corporate media is advertising? The answer starts with the rise in the number of long term unemployed shown in this second graph. According to the BLS, there are 4.8 million workers who have been unemployed for more than 26 weeks and still want a job. This is up from 4.71 million in January. Long term unemployment is a violation of the UN Declaration of Human Rights. 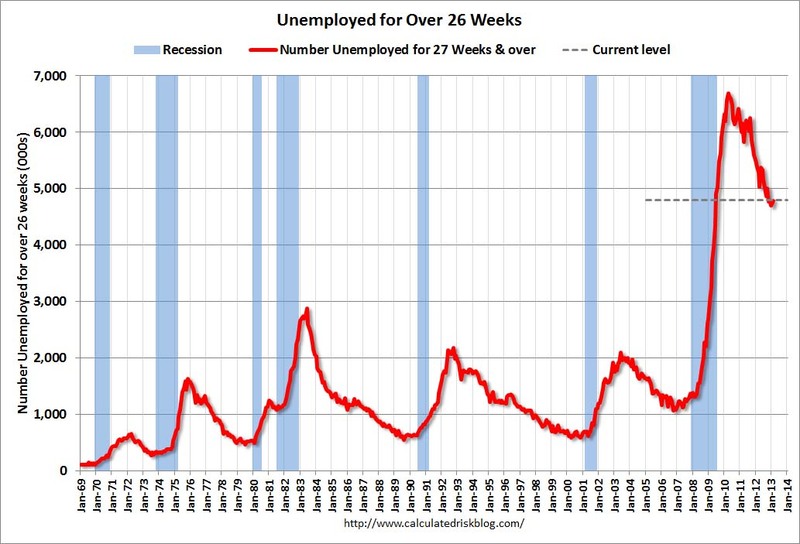 Long term unemployment is the ugly reality of dead end capitalism. The media doesn’t like to talk about this issue. These folks don’t count when calculating the unemployment rate. 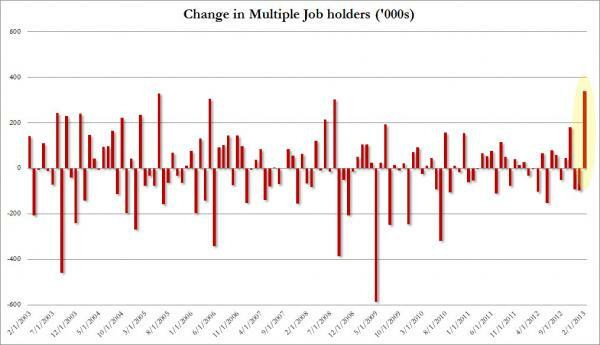 The composition of the new jobs also contributes to the happy headline numbers. The February report shows that the number of part-time workers increased while the number of full-time workers decreased. Voila! more jobs. In February according to the Household Survey, the number of full-time jobs declined by 77K from 115,918 to 115,841 while part-time workers rose from 27,467 to 27,569, or 102K. The income disparity is getting worse and the spending power of working people is further declining while more jobs are being created. This is not the stuff that makes for an economic recovery. The impact on working families is shown in this graph of wages and salaries compared to the value of the fruits of our labor (GDP). 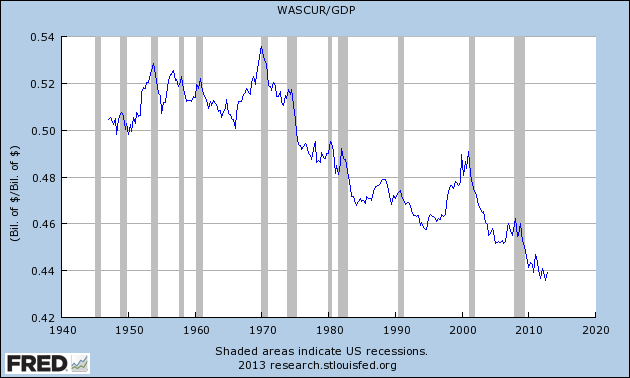 The point of sequestration and austerity is to drive this line lower and lower to make corporate profits higher and higher. This thinking is natural for owners of finance but it is flawed because profits can only be realized when workers consume the output of their own labor. This last graph should be familiar to those who’ve read It’s Time to Fight for Full Employment. This shows the slow paced advance out of the depths of the employment recession that began in 2007. 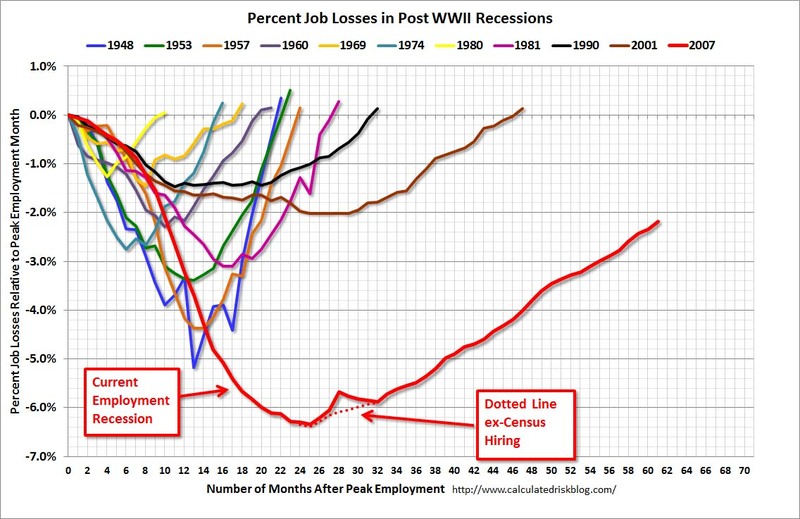 This is a much longer and deeper employment recession than any since the Great Depression. It is evidence that the system isn’t working any more and those in control have lost control. The rise in jobs just this year has come at the cost of $1.2 trillion in US government debt. Most of this debt was transfers to the big global criminal banks that are speculating in stocks, bonds, and politicians while calling for more austerity for working people. The political servants of the wealthy, now in power, must be replaced by political servants of the people. Then our capital can be invested in productive enterprises, our social fabric can be repaired, and the criminal banks can be liquidated. A Congress controlled by Progressive Democrats can pass HR 1000, the 21st Century Full Employment Act, that will tax Wall Street speculation to create a jobs and training fund controlled by the Department of Labor. Such a Congress will pass HR 676, the Medicare for All Act that will put everyone on Medicare, save $billions and create 3 million new jobs in the healthcare sector. Such a Congress will pass S 332,the Climate Protection Act, that will tax carbon to fund consumer rebates and transfer energy production from climate killing carbon burning to renewable solar, wind, and geothermal energy, another huge job creation project. 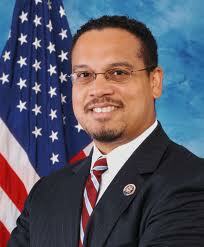 Voters in the PA 12th Congressional District are ready for a progressive Democrat to represent them in Congress. They have shown that corporate Democrats who oppose equal rights for women, who don’t support the top of the ticket, who oppose EPA protection for our air and water, and who cater to the right, can’t win elections anymore. Union members, young people, minorities, and women want to move our district out of the past and into a future of jobs, healthcare, and a sustainable environment. Thanks to Calculated Risk for some of the charts. 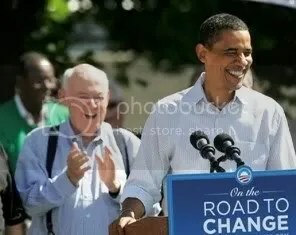 To join Progressive Democrats of America, go to http://www.pdamerica.org.